Recent news that the Russians have delayed the launch of their latest Mars probe made me think about a Mars Probe kit from that old-stager of the US model scene, Lindberg. Though its glory days were many years ago, Lindberg never really went away, though it has certainly had its ups and downs. Currently, a very wide-ranging list includes kits from the original ‘Lindberg Line’, along with companies Lindberg acquired along the way, such as Hawk and IMC. 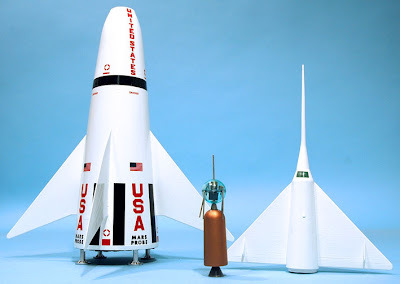 But if we go back to the 1950s, Lindberg was in at the dawn of the Space Age, with four kits of ‘factual futuristic’ rockets and spacecraft, based on designs from science-luminaries of the time, such as Wernher von Braun, Willy Ley and the space artist Chesley Bonestell. 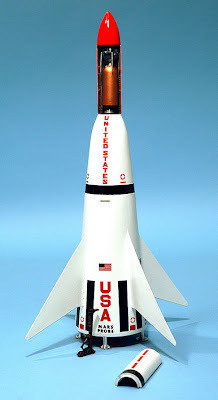 Four kits were issued in 1958: a wheel-shaped Space Station, a Moonship, and two versions of a winged Transport Rocket - one carrying a crewed delta-wing shuttlecraft, the other carrying a satellite. 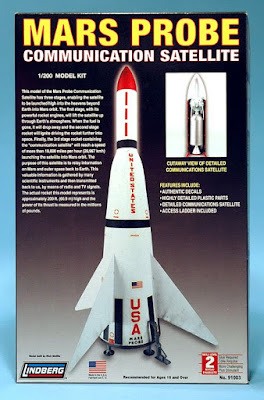 These kits were reissued in 1970, this time as the Mars Probe series, and again in 1977 as the Star Probe series, though the satellite launcher was absent that time round. Now, almost 40 years on, the satellite-carrying Mars Probe kit has been reissued. It’s a nice kit of a concept for a Mars-orbit relay satellite, with some parts moulded in clear plastic so you can see the internal parts. There’s a mystery bonus too - the instruction leaflet doesn’t mention it, but you also get a complete winged shuttlecraft from the ‘other’ kit, so that you can build two models if you want - just swap the upper stages over! This raises an intriguing point - until now, I’d assumed the scale of the two kits to be the same. Lindberg says 1:200, (perhaps taken from the listing in my Creating Space book), but on reflection there would be a vast difference in size between a winged shuttlecraft with crew aboard, and a far smaller satellite - if they were to the same scale, the satellite would have the unlikely diameter of some 46 m (150 ft)! So a rethink of scales is necessary - the shuttle can remain at 1:200 scale, but a satellite scale of 1:32 seems more reasonable. 1 Original kit from the 1950s. 3 Winged shuttlecraft and satellite, with launcher. 4 Satellite atop launcher. It stands some 330 mm (13 in) high. You can buy the Lindbergh Mars Probe here, and my Creating Space book here.